A team player is someone who gets along with others in the workplace and contributes to the company’s success. Typically, a team player is more concerned with accomplishing group goals than looking out for number one. Yet, team players still get ahead in their careers because employers value their contributions. Catch the vision. Listen carefully when your boss explains the purpose of a project. If you don’t understand it clearly, ask questions in a polite tone of voice. Then,express excitement about how meeting this goal will help your company. Even if you disagree, keep in mind that you were hired to help fulfill your employer’s goals. Help cast the vision. Make occasional com­ments to coworkers about the importance of the goal. Use the same language and reasons your boss named when announcing the project. Some coworkers may not embrace the vision right away. If someone complains or criticizes the vision, re­spond by redirecting their focus. You might say something like, “I understand your concern. But I really think this is going to be great for the com­pany because …” and then repeat your employer’s reasoning. Cooperate with your coworkers. If they need you to turn in a report in a certain format, or turn in an expense report by a certain date, do it. Let them know you appreciate their roles in the process by thanking them for favors and doing fa­vors for them. Meet your deadlines. If you don’t, you will delay others in doing their own tasks. And above all, don’t gossip about your coworkers, boss or clients. Participate in meetings. Offer thoughtful com­ments and public praise for coworkers who help you out or who did a great job. Help brainstorm new ideas. And listen attentively to what others have to say. You want to contribute to the conver­sation, not dominate it. Be flexible. Changes in the methods or job du­ties involved to reach the team goal are inevitable. They may be necessary to make the workflow more efficient or to adapt to a client’s change in the project. Be a problem-solver. If you or your coworkers hit a roadblock in the process of completing the project, bring it to your boss’ attention and suggest a solution to the problem. Be prepared to be a part of the solution you offer. Be reliable. Meet your deadlines, show up to work and meetings on time, and be prepared. Make your performance consistent. Give your best effort to every task. This shows others you under­stand how your actions affect the rest of the team. It shows your commitment to the vision. And it makes you the go-to person for a very impressed boss. Accept that conflict is normal. Don’t be of­fended or contentious when a coworker or boss disagrees with you. Try to understand other points of view. Someone may not agree with you, but they may actually have the better idea. Don’t let competition hold you back. Your boss will be impressed with your outward appreciation for a coworker’s great idea or job well done. It shows you care about the common goal. You will win the respect of your coworkers and boss, which will ultimately benefit you when your perform­ance review comes around. Own up to your mistakes. If you humble yourself when you err, you show integrity and earn respect. Your coworkers and boss will forgive you more readily if you acknowledge your mistake and how it affected the team. Offer solutions on how you will avoid the same mistake in the future. Being a team player has its challenges but also its rewards. By following these suggestions you will soon be recognized as a valuable team player – and everyone in your organization will benefit. 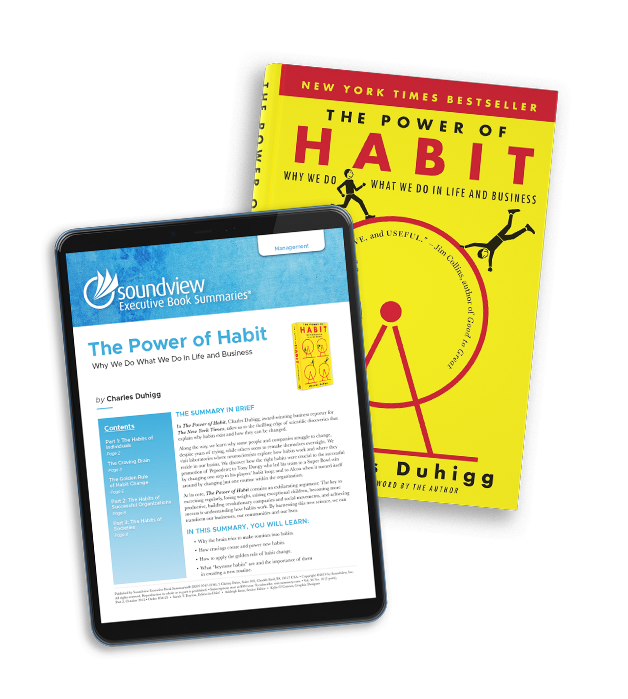 Soundview subscribers get in-depth summaries of the key concepts in best-selling business books delivered to them every week! Take your career to new heights by staying up-to-date with the trends and ideas affecting business leaders around the globe. Download a free sample now.